​April Birthdays: Sandra O’Meara, Fred Gaeden, Steve Boehm, Judith McCaffrey, and Darren Doi. April Anniversaries: Ken Beisser, Gary Jensen, Judith McCaffrey, Janet Napier, Joe Weiland. There will be a brief Board meeting right after the regular meeting. Any new members who need to get this marked off on your Red Badge Task Form are welcome to come. It would be a good opportunity to get signatures as well. The Montecito Rotary Club’s golf classic is May 15. Registration and lunch begin at noon, followed by the tournament at 1. They’re hoping our club will form a foursome. Dana Goba reported that the Group 8 PEs are crafting interesting things for the coming year. They got together at the District Assembly, which will be called the District Training Seminar in the future. 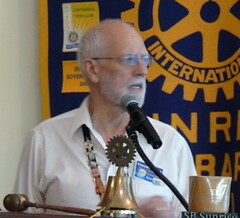 Don Bennett provided a Polio campaign update. The World Health Organization congratulated the countries of Southeast Asia as being polio-free. This includes India, which has not had a new case in three years. Next week one of the past presidents will be conducting the meeting as Betsy Munroe will be in LA letting the hip surgeon admire his work. There will be a Fireside Chat on Thurs., April 17th, from 6:30 – 8 PM at Betsy Munroe’s house for all the new members and anyone else who would like to join us. 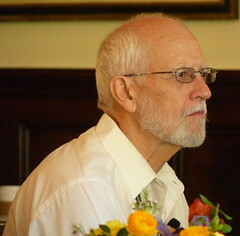 Please reply to Gillian Amery, Claude Saks or Betsy by 4/14 if you plan to join. Getting to Know You. Ed Fleming would like to go to Italy and tour it with his wife. Although he said his wife no longer wants to travel, plenty of women in the club volunteered to go. Graham Guess wants to have one week of uninterrupted sleep and to live overseas for an extended period of time — possibly Indonesia. Ted Deck‘s first job after college was running a place that rented out hot tubs. He learned that you can’t give people too many choices. For example, they could pick the music they wanted to hear from his full collection, but they spent way too long picking music. Raffle Results: $172 Karen Kawaguchi won. ​Pay and tell with Sgt. at Arms Joe Weiland. Our club has submitted two grant applications — one for the dental clinic and one for work in Nicaragua. Both were approved! She’s a water resources technician, focusing on community education. We’re experiencing the 3 driest years in recorded history for California. In January, the state declared a drought emergency. We are currently in a stage 1 drought. Declarations followed for the county and our local cities. Santa Barbara’s water supply comes from Lake Cachuma, Gibraltar Reservoir (Santa Barbara only), ground wells and Jameson Reservoir (Montecito). Leaders are planning an alternative supply strategy, which includes pulling more from groundwater, purchasing water and potentially, by 2017, desalination. The desalination plant was purchased in 1989. It was later taken offline and many parts were sold. Water agencies are requesting at least 20% reduction in water usage. Particularly reduce watering yards. Citywide water use in general has been above normal. Water use in the average home: 50-60% is outdoor water use. Watering your lawn for 15 minutes is 700 gallons. A 5-minute shower is 10 gallons. Check sprinklers to make sure they are not overwatering, leaking or spraying into the driveway or street. The city has a green gardener program to help train gardeners about irrigation. It’s against the municipal code for water to be running down the street. About half of the water we put on our landscape is thought to be wasted. Most water providers are willing to provide a free water checkup. They’ll evaluate your water use indoor and/or out. They’ll check the efficiency of your system and scheduling. They’ll also provide information on rebates and programs. The City of Santa Barbara has a rebate program covering irrigation equipment, waterwise plants and mulch, smart irrigation controllers and graywater materials. It often covers 50% of the cost of materials up to $1,000 per single family home. Laundry to Landscape DVD is available at all libraries. Supplies typically cost about $300. Learn more at http://www.waterwisesb.org. This includes the weekly watering index to help you adjust your watering schedule based on the weather. You’ll also find a plant database and can view virtual garden tours. They also have a TV show called Garden Wise available on Channel 20, Monday through Wednesday at 9:30 PM. Channel 18 Sunday at 9 PM and Tuesday at 9 AM. For 15 years they’ve offered a Green Gardener Program. It’s a 15-week class that covers sustainable landscaping, and about 6 classes specifically about irrigation. It’s about $35. It’s offered every fall and every spring. Indoor conservation opportunities: check for water leaks, replace old clothes washers with high-efficiency model, install low-flow aerators on bathroom faucets. A toilet leak can waste 200-300 gallons/night. “We’re trying not to be scary water police,” but you can report bad waterers — (805) 564-5460. As a token of our appreciation, it is the Club’s practice to donate 15 dictionaries to local 3rd graders in your honor. We have a book plate with your name on it that will be placed into the dictionaries. Next Week’s Program: Karen Kawaguchi and Chris Baxter will talk on their recent trip “Myanmar-One of the last unknowns”. to create my very own blog and would like to know where you got this from or what the theme is called. 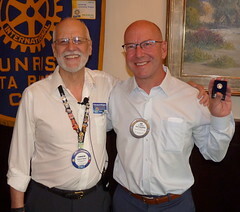 I don’t create a lot of responses, however after reading a bunch of responses here Minutes: Saving Water During a Drought (04/02/2014) | Rotary Club of Santa Barbara Sunrise Bugle.